The Praxis II Teaching Reading: Elementary Education test was designed to evaluate prospective teachers’ knowledge and skills pertaining to reading development at the elementary level. The Praxis II Teaching Reading: Elementary Education exam covers the five effective reading components identified by the National Reading Panel in an effort to ensure the inculcation of best practices among elementary reading teachers. How do I sign up to take the Praxis II Teaching Reading: Elementary Education test? First, make sure to check with the state in which you intend to teach, as each state has different eligibility requirements to sit for the exam. Registration for the Praxis II Teaching Reading: Elementary Education test can be completed online, after which you will immediately receive your test admission ticket. On exam day, you will need to bring your admission ticket and a photo ID. For an additional $35 fee, you can register by phone; or, you can register by mail by sending a registration voucher directly to ETS. To schedule your exam, check the ETS website for testing locations and available testing windows in your area. What fees are associated with the Praxis II Teaching Reading: Elementary Education test? The Praxis II Teaching Reading: Elementary Education test costs $139 at registration. You will incur an additional $40 fee if you need to change your scheduled testing location. Your initial score report is free, and additional score reports cost $50 per report. What does the Praxis II Teaching Reading: Elementary Education test cover? The Praxis II Teaching Reading: Elementary Education test is a computer-delivered exam consisting of 90 selected-response questions and 3 constructed-response questions. The selected-response, or multiple-choice, questions account for about 75% of your score, while the constructed-response questions account for about 25% of your score. You will be allotted 2 hours and 30 minutes (2.5 hours) to complete the Praxis II Teaching Reading: Elementary Education exam. Passing scores for the Praxis II are determined by individual states and educational institutions. Make sure to check the ETS state information page, along with your state’s website, for specific passing score criteria. If you live in a state that allows automatic score reporting, you will be able to retrieve your initial score immediately after finishing the exam. Including: understanding formal and informal assessments of reading; diagnostic reading data used to address individual students’ needs; assessing and monitoring progress; differentiating instruction to enhance development; Response to Intervention (RTI) process familiarity, etc. Including: understanding of phonemic awareness; oral development of language, as well as effective listening; alphabetic principle, including differentiation between case types; reading comprehension and fluency; age-appropriate reading comprehension strategies; word analysis, including semantics and syntax; respectfulness of cultural and linguistic diversity; cultural, psychological, and sociological bases of reading comprehension process, etc. Including: understanding the interdependence of reading development and writing development; writing as a developmental process; reading and writing used as tools for research and inquiry; writing in various forms; traits of high-quality writing; use of technology to enhance students’ skills, etc. Now that you have a good understanding of the associated fees, basic content, structure, and expectations of the Praxis II Teaching Reading: Elementary Education test, your next step is to begin preparing for exam success. When it comes to effective test preparation, you need comprehensive test preparation materials designed for thorough preparation. To help you pass the Praxis II Teaching Reading: Elementary Education test on your first attempt, Mometrix Test Preparation’s complete study resource, Praxis II Exam Secrets study guide, contains just what you need. 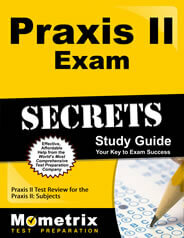 In the Praxis II Exam Secrets study guide, you get authentic Praxis II Practice Test questions, along with expert tips designed to help you improve memory, reduce test anxiety, and optimize your exam performance. 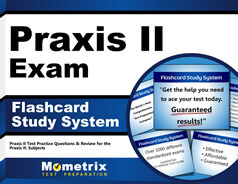 In addition to the comprehensive Praxis II Exam Secrets study guide, Mometrix has also created a complete set of Praxis II Flashcards, including additional Praxis II Practice Test questions. Begin your test preparation today by reading the Praxis II Exam Secrets study guide, and assessing your knowledge and skills using the Praxis II Flashcards and Practice Test. Let Mometrix help you earn the score you need to pass the Praxis II Teaching Reading: Elementary Education (5203) exam on your first attempt.